At 7 a..m. (EST), runners from Seattle to Fort Kent huddled in front of their computers, credit card in hand, hoping they would get a chance to run along the coast of Maine in August – in just five minutes and six seconds that chance was gone. The online registration for one of the most popular road races in the nation closed on March 15 in record time. Race organizers claim that this year’s registration closed three minutes and six seconds faster than last year. On March 14, 600 residents from Cape Elizabeth, the town where the event is held, had an opportunity to sign up for the race; the following day, the online registration system was open for another 4,000 runners. For those who have not been able to enter there is still hope. A lottery system for the remaining 1,850 spots is now up at running at the race website (Beach2Beacon.org). 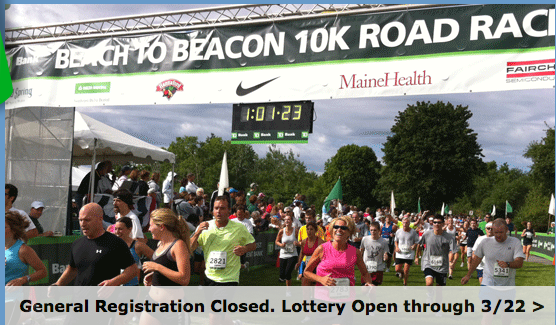 Runners pay an additional $5 to enter the lottery and may sign up anytime before midnight on March 22. The drawing for the lottery spots will be held on March 23. The race has become an annual draw for runners from across the nation and the world. There are often world-class athletes who lead the men, women, and wheel chair divisions, and it it is quite an honor to be either the first man or woman from Maine to finish the course. This year will be no different.